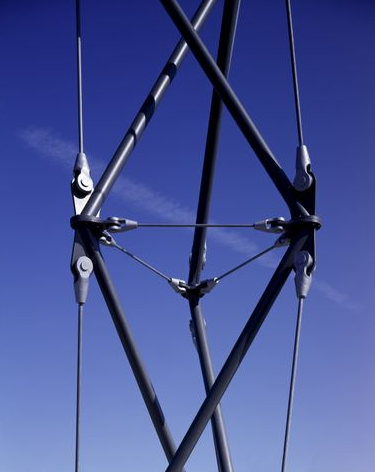 Read here about a tensegrity mast, the tallest ever deployed. Warnow Tower, measuring 49.2 meters tall and, with the addition of a 12.5 meter "needle", totalling 62.3 meters in height and 5 meters in diameter, was the tallest tensegrity tower ever built. 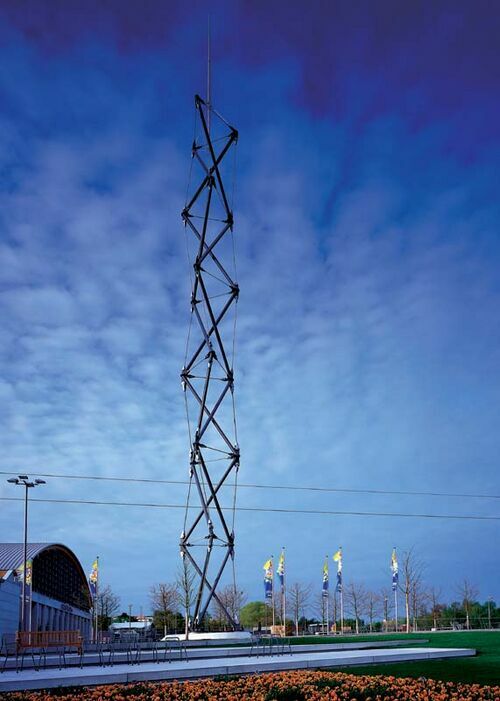 The tower was engineered by MERO Structures, Incorporated and erected at the 2003 Gardening Fair in Rostock, Germany. MERO was founded in 1928 by Dr. Max Mengeringhausen, who named the company after his system of tube-and-beam construction (MERO being a portmanteau of Mengeringhausen and "pipe design system", or Rohrbauweise). MERO completed in 2000 the Eden project in Cornwall/UK. This speactacular series of geodesic domes houses the greatest greenhouse in the world, with 30,000 m² of outer surface. The Eden domes feature spans ranging between 38 and 125 m, and are clad with inflated membrane cushions made of ETFE foil. MERO remains a world-leading engineering firm deploying tensile and node-and-strut space structures, such as Ferrari World in Abu Dhabi, 2009. MERO engineered the Warnow Tower for the exhibition grounds of the 2003 Hanseatic Trade Fair, also known as the Gardening Fair, IGA Park, Rostock, Germany. The tower was raised in only ten days time. According to the BauNetz Online Architect's service (see original German article below), the tower had a diameter of 5 meters. It was composed of 6 3-strut t-prisms, called "twist elements" by the firm. Each prism being 8.3 meters tall. A prism was composed of three steel-tube compression members, three heavy-duty diagonal cables and three thin horizontal cables. Each stacked prism in turn was rotated by 30 degrees. To enable the tower to achieve an even greater height, the architects added a stainless steel needle, hung by ropes from the top prism, adding an additional 12.50 m to the tower. The tower was founded on a concrete base and foundation piles with a diameter of 8 meters. The base also featured floor lamps that illuminated the structure at night. 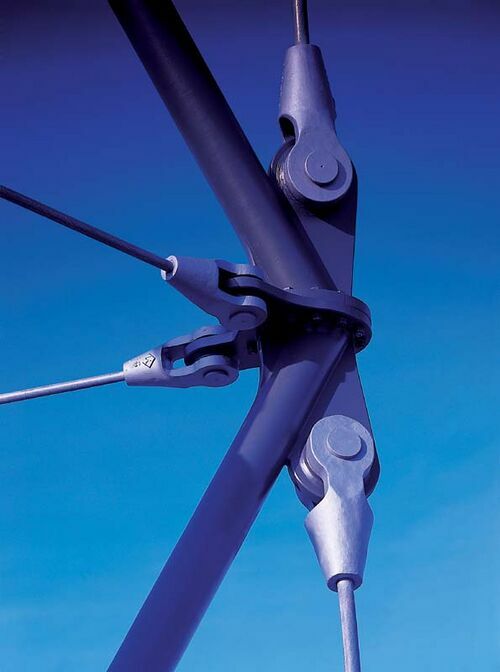 Tensegrity towers of this scale are exposed to significant wind shear and stress. The Rostock fair ground in particular is exposed to strong winds accelerated by pressure systems over the Baltic Sea coast. MERO's engineers added a "push rod contact" to increase the systems pre-stress, and also used high-strength materials such as full locked coil ropes normally deployed only in cable-stay (suspension) bridges. Warnow Tower, side view. The silver needle on top is barely visible. The wires in the distance are a cable car. Warnow Tower, close up of a node. Warnow Tower, close-up of the junction of two 3-strut t-prisms. The readings are in English and German. In this publication Mike Schlaich, the tower's designer, explains the tower's structural design and analysis. Schlaich concludes that the structure's inherent flexibility and irregularity make them ill suited to conventional building, but useful for roof structures. Originally published in the Journal Of The International Association For Shell And Spatial Structures, Vol. 45 (2004) no. 145. Am 22. April 2003 wurde im IGA-Park 2003 in Rostock das Richtfest für den sogenannten Warnow-Turm gefeiert. Architekten der knapp 60 Meter hohen „Landmarke“ sind die Hamburger Architekten von Gerkan, Marg und Partner (gmp). Die Ausführung fand in enger Zusammenarbeit mit dem Ingenieurbüro Schlaich Bergermann und Partner (Stuttgart) und der Mero GmbH & Co. KG (Würzburg) statt. Das bauliche Gesamtensemble der Hanse-Messe, bestehend aus Ausstellungshalle und Tagungsrotunde, erhält damit einen Abschluss und seine Identität durch einen Turm, der sowohl tagsüber als auch bei nächtlicher Beleuchtung zum Wahrzeichen für die IGA 2003 und die Hanse-Messe werden soll. Das Besondere des Turms, bei dessen Richtfest Volkwin Marg deshalb auch von „einem Wunder“ sprach, ist seine Konstruktion. Das Richard Buckminster Fuller nachempfundene Prinzip der „Tensegrity“ (Wortschöpfung aus „tensional“ und „integrity“) beschreibt Tragwerke, die aus einem kontinuierlichen System von Zugelementen und einem diskontinuierlichen Subsystem von Druckelementen bestehen. Diese extrem leicht wirkenden Systeme verdanken ihre Stabilität der sehr hohen Vorspannung aller Komponenten. Der Rostocker Tensegrity-Turm hat einen Durchmesser von 5 Metern. Er setzt sich aus sechs übereinander gestellten 8,30 Meter hohen, um 30 Grad verdrehten, prismatischen Dreieckselementen – sogenannten Twistelementen – zusammen, die jeweils aus drei Stahlrohr-Druckstäben, drei hochbelasteten Diagonalseilen und drei dünneren Horizontalseilen bestehen. Den oberen Abschluss bildet eine scheinbar schwebende Edelstahlnadel, die wie das Tensegrity-Tragwerk des gesamten Turms als skulpturales Element wirkt. Sie wird mittels Seilen in das oberste Element gehängt und ragt 12,50 m über den Turm hinaus. Ein auf Bohrpfählen gegründeter Betonsockel mit einem Durchmesser von 8 Metern bildet den Basispunkt der Turmkonstruktion. Die auf den ersten Blick verwirrende Anordnung der Turmkomponenten, dessen Spitze sich im Sturm bis zu 1,50 m hin- und herbewegen wird, offenbart erst nach einiger Betrachtung die innere Ordnung des Turmes. Seine Ansicht erscheint je nach Standpunkt des Betrachters völlig verschieden. Die bisher einzigartige Höhe des Rostocker Tensegrity-Turms, der zudem den starken Winden der Ostseeküste ausgesetzt ist, wurde durch Anwendung eines Tricks möglich: Durch die Einführung von einfachem Druckstabkontakt konnte die Steifigkeit des Systems enorm erhöht werden, ohne dass der angestrebte visuelle Eindruck Schaden nimmt. Trotzdem ist der Turm nur tragfähig, weil bei Planung, Fertigung und Montage mit einer Präzision gearbeitet wurde, die ansonsten nur im Maschinenbau üblich ist. Zur Anwendung kamen hochfeste Materialien (zum Beispiel vollverschlossene Seile), wie sie im Brückenbau eingesetzt werden. Nachts wird der Turm über im Sockel angeordnete Bodenstrahler beleuchtet. Durch das Licht- und Schattenspiel der einzelnen Zug- und Druckstäbe wird sein skulpturaler Charakter verstärkt. Zusätzlich dient ein Hochleistungsscheinwerfer als Effektbeleuchtung, der bei Veranstaltungen eng gebündeltes weitstrahlendes Licht ermöglicht. Die IGA 2003 wird am 24. April 2003 in Rostock eröffnet. Link: http://www.baunetz.de/meldungen/Meldungen_Richtfest_fuer_Warnow-Turm_in_Rostock_13391.html accessed, 15 Nov 2010. Fertigung Und Montage Des Messeturms in Rostock by Klimke, Stephan, Essrich. The making of this tensegrity tower is described, in German. The tower is discussed as based on a triangular pattern that is rotated by 30° at each segment (twist element). The realization is based on the highest possible production accuracy, especially for the cables, and a consistent concept for tolerance compensation. A major subject is the pre-stressing of the cables that turned out to be possible by moving the three base points of each segment inwards simultaneously by means of a horizontal frame with three jacks, each with a capacity of 100 tons. The tower was pre-assembled from the twist elements in two parts. The upper part was finally lifted on top of the lower part by means of a 170 t mobile crane. Tensegrity by Carstens, Kuhl, Gacm 2008. In this PDF Sönke Carstens and Detlef Kuhl of the University of Kassel Institute of Mechanics and Dynamics focus on the tower to report on computational mechanics of tensegrity structures. The static and dynamic simulation of tensegrity structures, as special examples of relatively flexible structures, is discussed. The tensegrity tower in Rostock is analyzed using the spatial finite element discretization method and the GALERKIN time integration scheme of polynomial degree p. The determination of the reference geometry and the initial stress state the assembly of the tensegrity tower was simulated by a geometrically non-linear static analysis. Chapter headings include spatial GALERKIN discretization by tensegrity elements, semidiscrete equation of motion, temporal discretization by GALERKIN methods, and static Analyses of Tensegrity Structures. Snelson's helixes are analyzed for prestress. The tower in Rostock is then analyzed and its behavior under stress in an earthquake is simulated. A MERO systems promotional publication. The Warnow tower is featured on page 7 in a full page photograph and some descriptive text. The designer is mentioned, and the fact that it only took ten days to construct the tower. This page was last edited on 28 November 2018, at 18:15.